If you follow me on Instagram, you’ve probably seen the pictures of all of the stuff I have. Let me be more specific – you’ve been subjected to seeing all of the crap I’ve carried around with me since I moved out of my parents’ house in 1992. I wasn’t given it all at once – my parents moved to British Columbia shortly after I graduated university, and before they moved, they made me take all of the stuff that meant something to me so they wouldn’t have to ship it across the country. house that had moved across the country with them. Including more boxes of stuff that had belonged to me. When she found her own place here, she asked me to come and get more of my stuff because she did not have room for it. I was moving into a luxury apartment with a giant storage locker, so it wasn’t a problem at the time. Ten years later, when my husband died, I had to move from the apartment, if only to get away from the memories there. I had just gone through all of his stuff, and was in no position to sort through anything else. I just wanted to go, so I found a place and brought all of those boxes of mine with me. The next year, I had to find a new place, because the place I did have was too small for me and my new partner and our baby. It was a matter of time being of the essence, and we found a gigantic three-bedroom luxury apartment. So I moved everything with me, boxes and all. From the apartment, I bought my house, and with house closings being what they are, I had to get someone to take over my lease while packing and getting ready to move 40 km away, and trying to find daycare and school for my son, so I just dumped everything out into bags and boxes, and then carried that along with the already-packed-often-moved-always-unopened boxes with me. I have a Harry Potter-style cupboard under my stairs, but instead of making it into a bedroom, I put all of my boxes in there, along with my partner’s boxes and our intermingled stuff. Because we were going to be together for a long time, living here for a long while, right? When we broke up in 2013, the easiest thing for us to divide were our CDs, simply because we had duplicates of the music we had in common, and everything else was either his or mine. So the CDs have been in separate milk cartons and boxes since the end of 2013. There was no rush to do anything else, because he has stayed on here as my roommate for the past year and a bit. But now, he’s found his own place, and is moving out in the spring. And this year it will have been ten years since my husband died. And I will be turning 45. And frankly, it was time. I mean, I always knew I had a bunch of 80s artefacts, but I always wondered what had happened to them. So a couple of weeks ago, I started going through my Harry Potter space. I expected to untangle myself from one man. By the third box, I realised I wasn't untangling myself from one - I was untangling myself from at least five, and all of the other failings of the past. I found about 10 printed drafts of my first novel, tax returns from the 90s, critiques of works that were written by other people, bills from 2000 that were hastily thrown into boxes for a move, pictures and writings of exes that I hope are burning in hell or will be shortly, and all of the crap that I chose to post to Instagram. In other words, crap that had to be purged. It’s a new year. It’s a new day. It’s a new life. Get rid of the old and not let it burden me. However…in among the knotted ropes of the web of memories stashed in my Harry Potter space, I found things that made me happy at one point. Things that reminded me of the person that I lost along the way over the past 30 years or so. The person who went to Toronto by herself on the bus on weekends to just walk around and buy imported records and flowing goth clothes. The person who always enjoyed her little nook where she would write a poem dedicated to her amour du jour and pine over why it was never meant to be. The person who used to stay for hours upstairs at Toby’s on Bloor or Toby’s on Yonge in a corner table, smoking, drinking coffee, and writing to try to figure out how to make life work and what I saw around me. The person who was an entertainment journalist for four years and attended the 1989 Festival of Festivals on a press pass, interviewing well-known French producers and directors in French. The person who went to the opera and fell in love with the medium more than any of the people I ever went with. 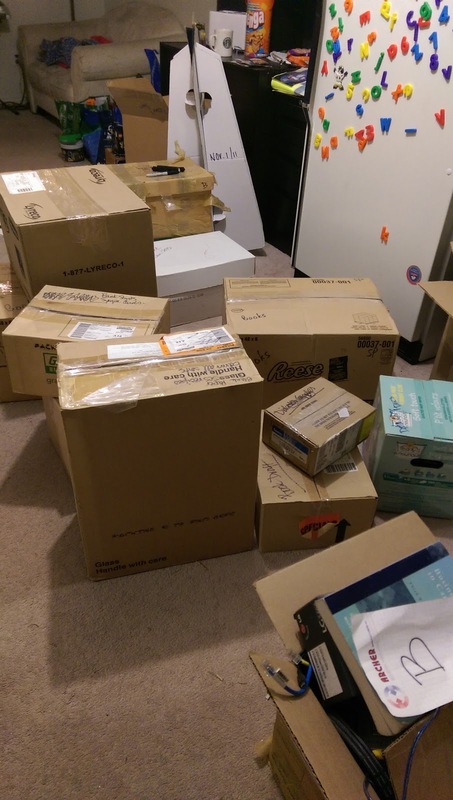 I have gone through about 90% of the boxes that have travelled with me for the past 20 years. Some things I have thrown away – I don’t want to see tax returns after I file them, never mind from 1991 – but some things I have kept – the paraphernalia, the newspapers with headlines like “MASSACRE” (about the Montreal shootings December 6, 1989), the magazines with the “Top 100 albums of the 80s”, the scrapbooks with clippings about up and coming bands called Ministry and Skinny Puppy. I’m coming back to discover those things that are at the core of me. Those things that people rarely understand about me – how I can like music for music’s sake and not confine myself to one or two genres, how I can keep writing without freaking out about not being published, and why I need so much alone space and time, even from those people who mean the most to me. It’s neat to be able to follow your own journey of development through boxes and boxes of material. Now those myriad of boxes have been pared down to two so far. I still have the books to go through. As a mom who was an only child who has only one child, there’s a legacy I have to leave to my son; an obligation where I have to explain to him and him alone why I am the way I am. I think and hope that all of the stuff I’ve been able to find will do that. If anything, when I do finally shuffle off this mortal coil, the stuff I have might remind him that this was who his mother was – an uber-passionate fangirl, a writer of feelings in whatever form struck her at the moment, an appreciator of music in all forms, and most of all, everything she gathered, everything she performed, every step and every thing she ever did came from a place of deep love.